The Zoo’s Florence Mila Borchert Big Cat Country recently welcomed a 14-year-old caracal named Cammy, who was acquired from the Audubon Nature Institute of New Orleans, LA. The 25-pound female is adjusting nicely to her new home and is often seen sitting close to the viewing glass of her exhibit. Although she frequently hisses at people, her keepers believe she may like to be near people. Caracals, also known as the desert lynx, live in Africa, Asia and India. They are known for their very distinct, long black ear tufts or tassels. The exact purpose of their ear tufts is not known, however there are many theories. Some believe the tufts serve to camouflage the caracal or help keeps flies off the animal’s face. 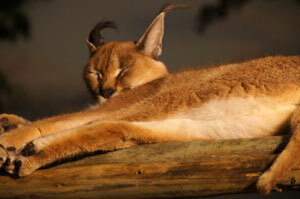 The most common belief is that the caracal moves its ear tufts to communicate with other caracals. One of the most interesting facts about caracals is that they can leap 7 feet into the air from a standing-still position! Visit Cammy daily in the Zoo’s Florence Mila Borchert Big Cat Country.